These Polish pancerni from TAG have taken me ages to paint. From the front they look nothing special but when you see the bottom two pictures you will see that the rumps of the horses are all covered in a rich panoply which was highly decorated. These are very nice figures but TAG has gone a little over the top in equipping them. 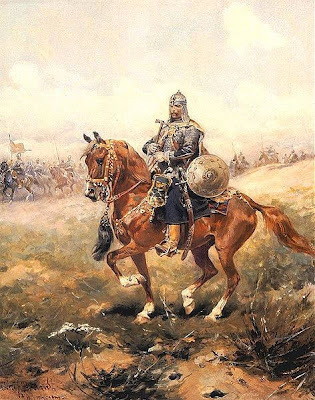 They are armed with a) lance b) shield c) two pistols d) bow and arrows e) carbine f) sword so getting their horses to get up to a gallop might be a bit of an issue. Also the standard bearer is a conversion of a drummer who is, oddly, supplied without a drum (he just carries two drumsticks!). I really should be back on the ACW by now but I have one more small addition to this Polish army to complete in the next couple of days. I'll post that by the weekend. On an aside, I always find January a highly productive month for painting - grey nights and cold weather spurs me to my painting table. They do look great from the front, but your work on the blankets is incredible. Looks like TAG missed out the Konzerz saddle sword... how remiss of them to send out this poor banner incompletely armed! 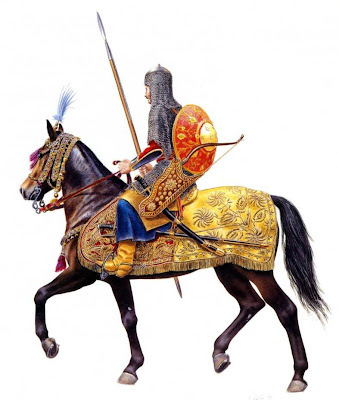 I understand that carrying as many arms as possible (including axes and maces- also missing) was a features of both these troops and the winged hussars. 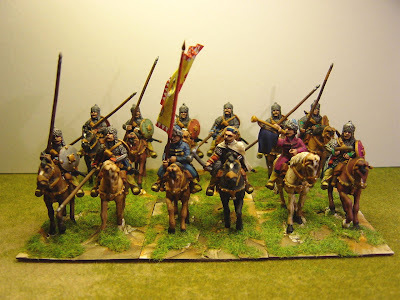 Somewhere I've a link to a fantastic scratchbuilder of Polish troops- I'll dig it out if anyone's interested. If you want Napoleonic superdetailing info (probably not possible at this scale but I used to do 1/12th scale) visit http://en.empirecostume.com. 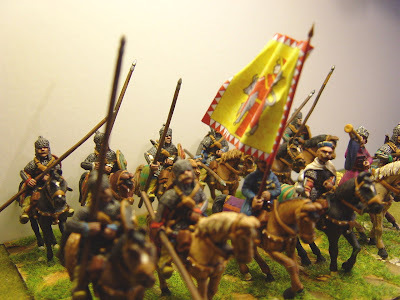 By the way: I've been looking at your site (and the excellent 72nd scale Plastic Soldiers)for ages, tho' I'm no longer in the hobby I used to do Historex (very badly and 1/12th scale conversions and scratchbuilds- mainly French Napoleonics. I still have an interest and the Parry and Vitrix plastics look like an easy route back in so I may give it a go. How tough was the conversion of the kettledrummer to a standard bearer? I am currently going through a "I hate musicians" phase and extra lancers are always useful. simply awesome, currently painting some pancerni myself and wondering if I should leave the panoply and standard colour (red) or put some scroll work on them, after seeing your completed work I think I will have a crack at tricking them up! I also have 50 pages of hussar reference material (lots of C&P pics) which I put together for a scratchbuild that I never got around to if anybody wants them just ask. Catching up on few blogs and I'm gobsmacked by these, Nigel. Outstanding work! Like Giles just belatedly catching up on some blogs and I am equally gobsmacked by these husaren & Pancerni. They are beautifully done and as I just commented on another of your posts - the standards are fantastic. 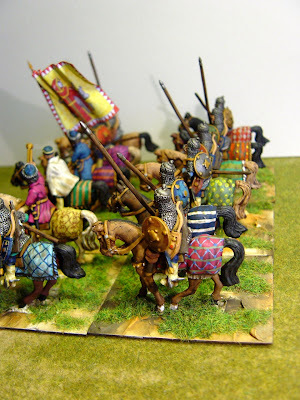 I love the Polish of this period and have an army of them myself - have you any success at gaming with them? If so, what rule set did you use? 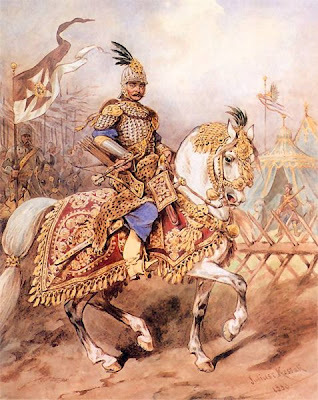 I've tried a version of WAB ECW but there's no allowances for Winged Hussars which makes an otherwise good rule set awkward. 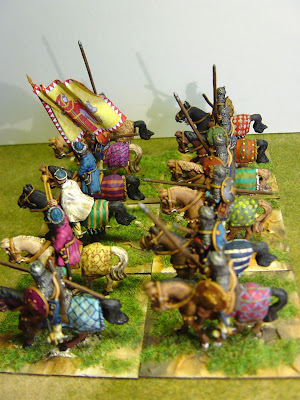 So, not much wargaming success - but the figures look pretty. The detail on yours is amazing - I have no wonder that they took you so long to do. Brilliant job.